Kombiner besøk på Namua Island og påske Upolu med en samoansk høyester som guide på denne unike turen i Samoa. Lytt til Chief Tais dybdegående kommentar om Samoa historie og kultur mens du besøker høydepunkter som Lalomanu Beach, Sopoaga Falls, Vavau Beach og To Sua Ocean Trench. Hopp i det turkise vannet for å svømme og snorkle blant skilpadder og annet marint liv, med snorkelutstyr som tilbys. 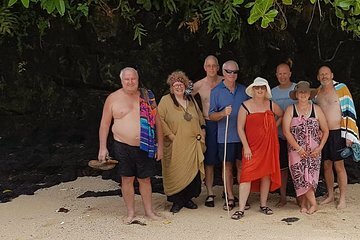 My partner and I went on two day tours with Tai while we were on holiday in Samoa and we can't recommend him highly enough! Our first tour was to Namua Island and the beaches of Eastern Upolu. Tai provided us with the history of Samoa on our air conditioned drive to our first destination. He is very knowledgeable on the history and culture and we learned a lot. Namua Island was picture perfect and we saw many turtles on our short boat trip to and from the island - nice to see them in the wild. We swum, had lunch and lounged in the fales. After Namua, we had a beer at Lalomanu Beach gorgeous!, then carried on to Tai's favourite beach and then on to To Sua trench. I was not brave enough to go down the ladder, but it was a stunning place! Sopo'aga Waterfall was last on our list and we also got a demonstration from Tai about how to open and shave a coconut! The chickens were pleased to have a feed! Tai then shouted us a MASSIVE banana ice cream and dropped us back at the hotel. A day well spent! We then contacted Tai again to ask for another trip to Savai'i - the biggest of the Samoan Islands. Our day was filled with a beautiful ferry ride across the strait, amazement at the beautiful decorations put up for miles in celebration of the Miss Samoa pageants hosted by Savai'i the previous weekend. We had a quick breakfast at the beautiful resort and then straight to the Saleaula Lava Fields - complete with the LMS Church still standing and Virgin's Grave. Tai was very informative about the correct history of the eruption and it was by far my favourite place. Swimming with the turtles was next and my partner hopped in and admired the turtles in the water. To round out our day, Tai took us to the local markets and showed us the local handmade wares. We then hopped back onto the ferry and made our way back to the hotel. Tai was polite, informative, funny and personable. He tailors his tours to what you want to do and knows the islands and it's people well. If you're planning a trip to Samoa and want to see the sights, Tai is the way to do it! We booked Tais Native Experience through Viator before leaving home. 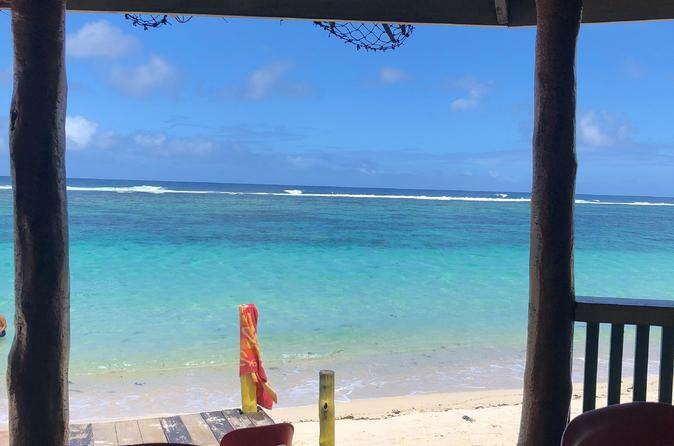 The first day was a trip east of Samoa traveling to the beautiful island of Namua where we had lunch, swam and relaxed before spotting turtles swimming alongside the boat on the way back to the mainland. We visited To Sua Ocean Trench, Sopoaga Falls and various other stops. All the while Tai was telling us about his wonderful Samoan culture. He is passionate about his country and it shows in his enthusiasm. During the day we were talking about the Samoan traditional cooking method of an umu which he then set up for us for the next day. Day two was a trip into the township of Apia to see the police band start the working day at 9.00am followed by the markets. Lunch was a traditional suckling pig, taro, fish and coconut cream and Luau coconut cream, onion and salt cooked in young taro leaves. It was wonderful to see what an authentic Samoan feast is like. We finished the day with a swim at the Cave Pool. We decided we would hire Tai for one more day for a trip to Savaii. Day three we were picked up early to take the ferry. When there we were treated to a demonstration in Siapo making, creating fabric from bark and painting it with resin from trees. We then saw the amazing blow holes which was magnificent showing the power of the sea. We would have no hesitation in recommending Tai as a tour guide. His air conditioned van was good for the hot days. His commentary and knowledge is as good as it gets. Our first visit to Samoa was made so enjoyable because of Tai. Tai, a High Chief, makes you understand and appreciate his culture.